Conveniently located across the street from Kamaole Beach I which is ideal for swimming, snorkeling, boogie boarding AND heavenly Sunsets! Easy walk to restaurants and shopping! This 2 bedroom, 2 bath condo has beautiful ocean views and located on the quiet side of the building! There is a fully equipped kitchen and washer/dryer. Master bedroom and guest bedroom has queen beds, w/ a queen sofa sleeper in the living room. Tropical breezes flow thru this condo w/ 2 new high powered ceiling fans in both bedrooms and a/c in the living room. Complimentary High Speed Internet/ Wifi, & free long distance Inter-Island, USA, Canada, Mexico, China, Japan and 30 other countries. Amenities on the property include swimming pool, & shuffleboard. There is also a Roof Top Garden w/ large BBQ's, picnic tables, with panoramic ocean views perfect for entertaining. Or an Aloha Room Lounge area that could host family functions or for kicking back and reading ~ relaxing. Who could ask for it now! Call for Low Season SPECIALS! This was our first time to Maui and we wanted our family vacation to be perfect! Well it was, and staying at KBR with my three kids dealt fluke I was at home. I love how we were just across the street from the beach and there were plenty of things to do at walking distance. Definitely will be returning to this destination in the future! Much mahalo for your wonderful review on the popular Kamaole Beach Royale 302. We're glad you and your family had a memorable Maui vacation! 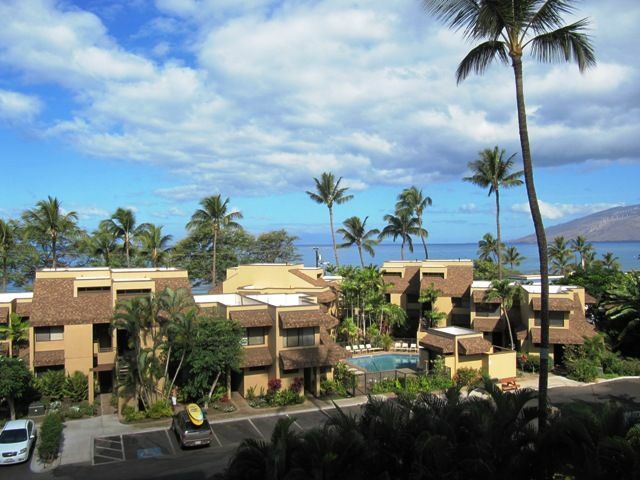 Yes, KBR is ideally centrally located in Kihei with easy walks to the beach, shops and restaurants! I arrived to the rental 2 days late due to flight delays and having to report to work the next day. Vince from the management office was great. He was there late and made sure to stay to make sure I was able to get in. The condos was great. Nice and clean and quiet with great views. My only complaint is that the Lanai furniture is not very comfortable. I barely used it. The views were great, the bed comfortable and the 7th floor terrace ideal for grilling. Thank you! Your review is very much appreciated. It is good to know you were assisted with check-in and that you enjoyed the property.